We had so much fun making your Valentine's this year. As we worked together, I smiled thinking about all of your past Valentines. Most of them turned out pretty cute, but some were pretty miserable to make. We started out fairly easy. 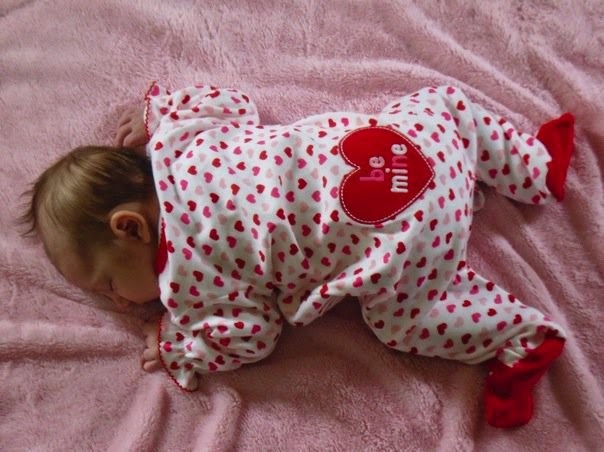 Your first Valentine's Day, you were not even two months old. 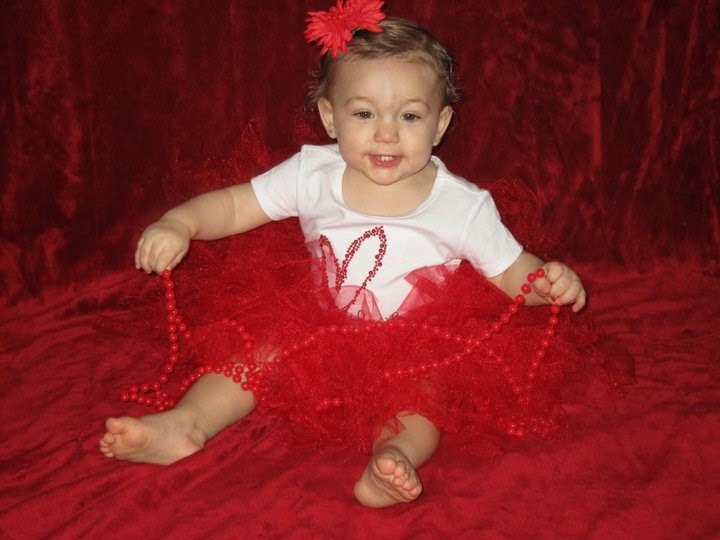 We had a little Valentine themed photo shoot, & I used the pictures to make photo cards for Daddy & our parents. At a month & a half old, it was tough to get photos of you where you were looking at the camera & not moving or crying. But just look at that cute, teeny, little bum. The next year we did the same thing, a photo shoot & photo cards. This photo shoot proved to be even tougher. You moved around a lot & ate most of the props. 2012 was the first year you had classmates to give Valentines to, & we got a little more creative. Our Valentines still involved a photo shoot. I asked you to hold your hand out in a fist. 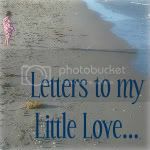 We printed your photos with a message & slid lollipops into a slit in the photo. Your Valentines became 3D & looked like you were holding out a lollipop to your friends. These Valentine's were cute & fairly easy. At the age of two, you couldn't understand why I wanted you to hold your hand out in a fist...I don't think you even understood what a fist really was. I finally gave you a clip to hold in your hand & asked you to hold it out to me. We ended up with an OK shot. We should have called it a day at that point, but I decided to get fancy & make hand print Valentines for our friends & family members as well. 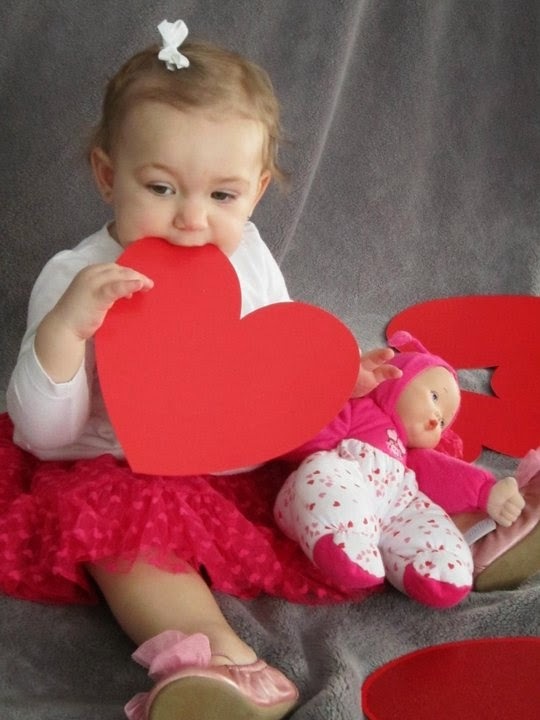 They came out cute, but my little Valentine was pretty Valentined out by then. You were a cranky mess, & I realized maybe I had overdone things a little. Of course after overdoing things the previous year, in 2013 I decided to take overdoing it to a whole new level. You had studied owls in school that year, & I found adorable Valentine owl bags that we could put together. You were really into it...for the first two bags. Unfortunately, I think we made 40 of them. 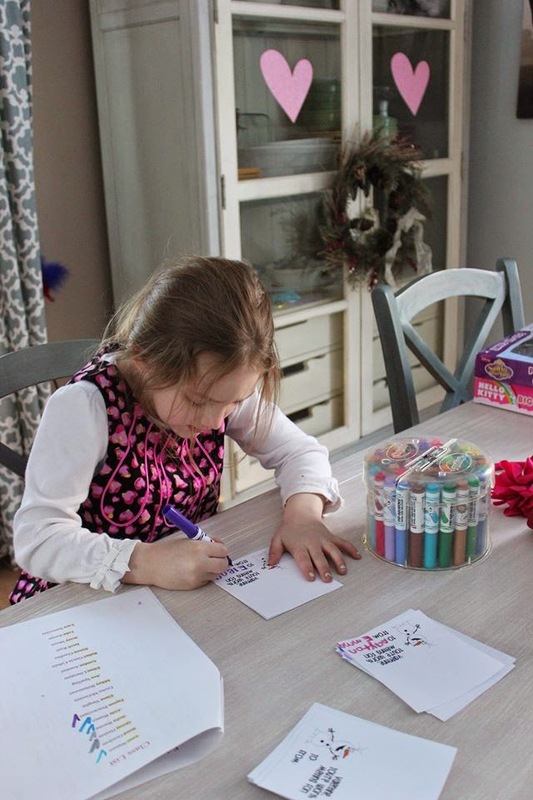 Of course I had to add another owl making Valentine project, which involved a lot of cutting & using the hot glue gun...which pretty much meant you couldn't even participate in that portion of your Valentines. Then we made cookies (because I felt guilty your Valentines didn't have a candy/treat component)...which may have happened after you were already asleep, because, lets face it, we were both exhausted from making your Valentines that year. The next year, I was still burnt out from Valentine making & we decided to go back to the 3D lollipop Valentines. We did another photo shoot, & I realized we should never have a photo shoot before you've eaten breakfast. In the end, we got a cute photo, & you helped create your Valentines by writing your classmate's names by tracing over what I had written in yellow marker. There were only a few tears involved in the creation of those Valentines, & I called it a success. This year, I decided to take a new approach. I looked up handmade Valentines on Pinterest, & asked you to look through them with me. As we scrolled through, I let you pick out your favorite. 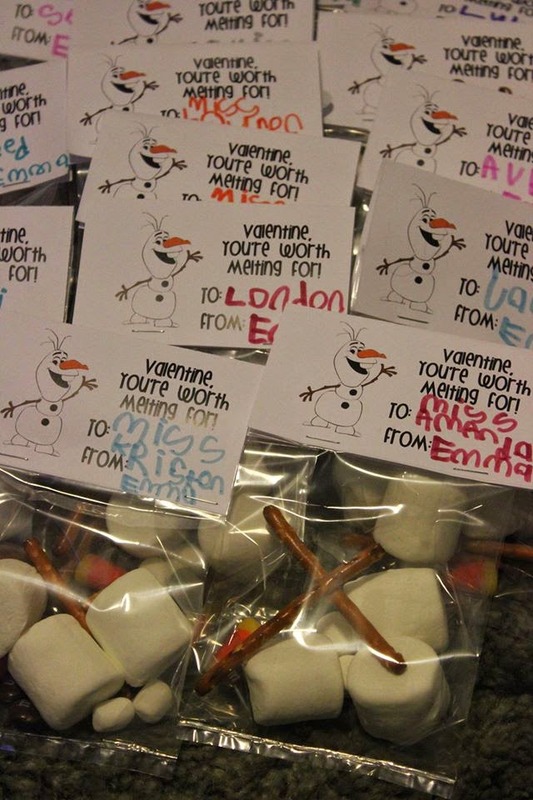 You chose a cute, little Olaf Valentine. 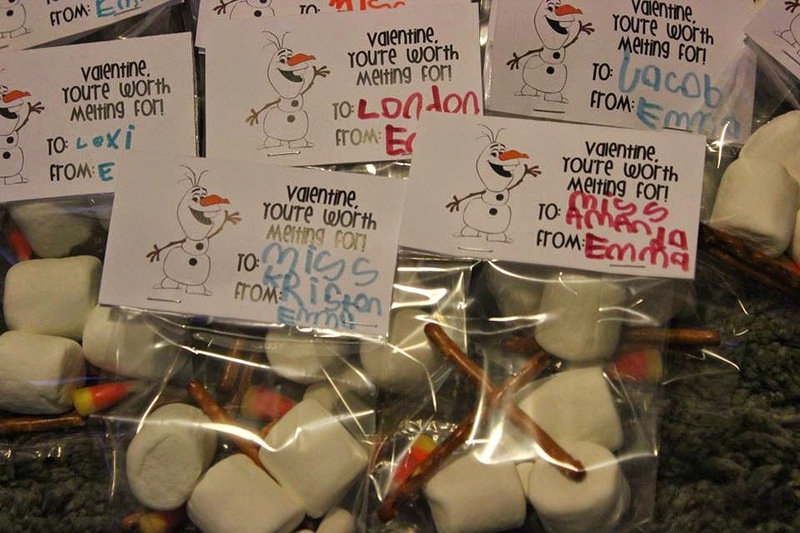 I shouldn't have been surprised that the Valentine you chose was Frozen themed. It looked fairly easy to make, & I was confident this was a Valentine we could work on together. We downloaded & printed the free file (we printed extras to allow for mistakes). I cut them out into rectangles. Armed with a list of your Valentines, you addressed each one all by yourself. You read off each name on your list, tried to use what you thought was that person's favorite color, & carefully wrote out each name. It took you quite a while (you have over 30 Valentines this year). You worked so hard, & I watched from a distance, beaming with pride. 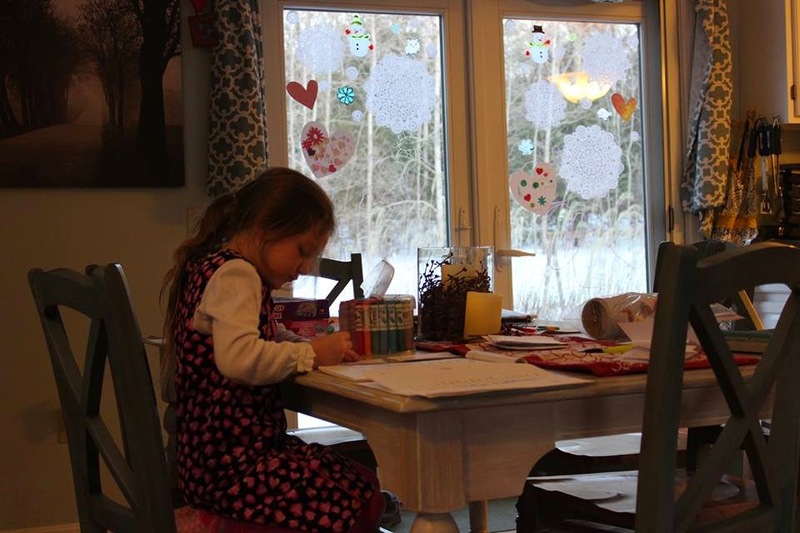 I couldn't believe that you were working on your Valentines ALL BY YOURSELF. You made a few mistakes, but you remained very patient. After you were done addressing your Valentines, you had fun adding some extra decorations. 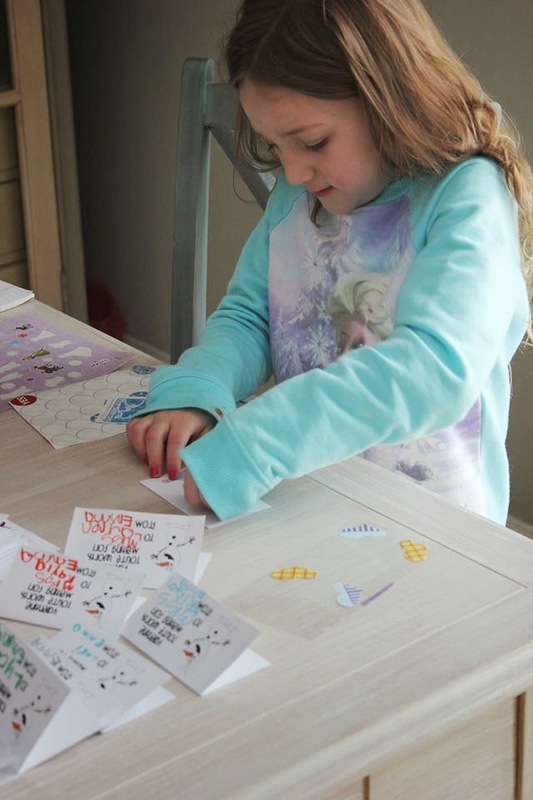 You added Frozen, heart, & winter themed sticks to the backs of each page. You were very careful to try to use each person's favorite colors & Frozen characters. It was really stinkin' cute. 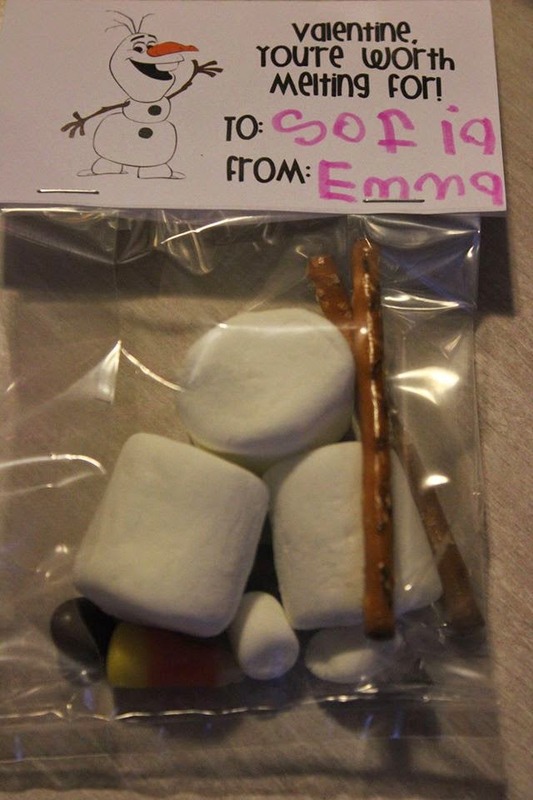 Once we were done, we filled the bags together with the melted Olaf goodies. 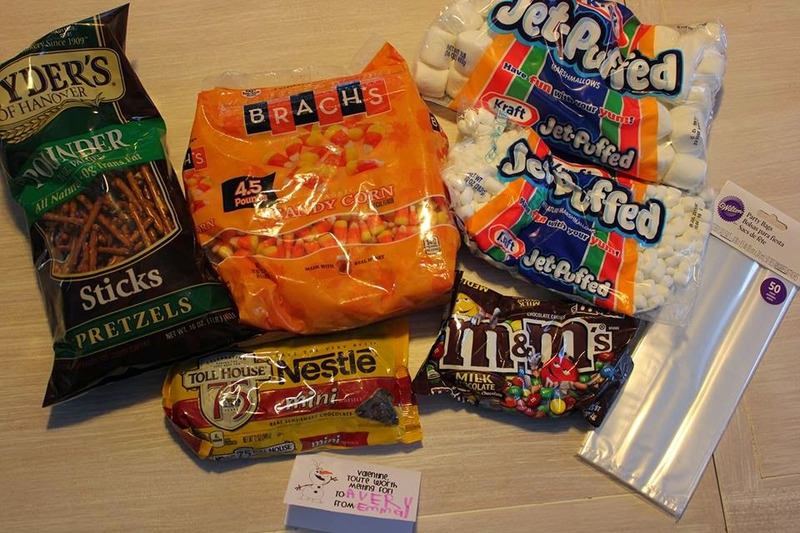 Each bag had 3 large marshmallows (the body), two mini marshmallows (the feet), a candy corn nose, two pretzel sticks for arms, two mini chocolate kisses for eyes, & two M&Ms for buttons (we tried to use brown, but once we ran out we used other colors). It truly looked like bags of little, melted Olafs. You passed me each addressed Valentine, & I stapled them to the bags. 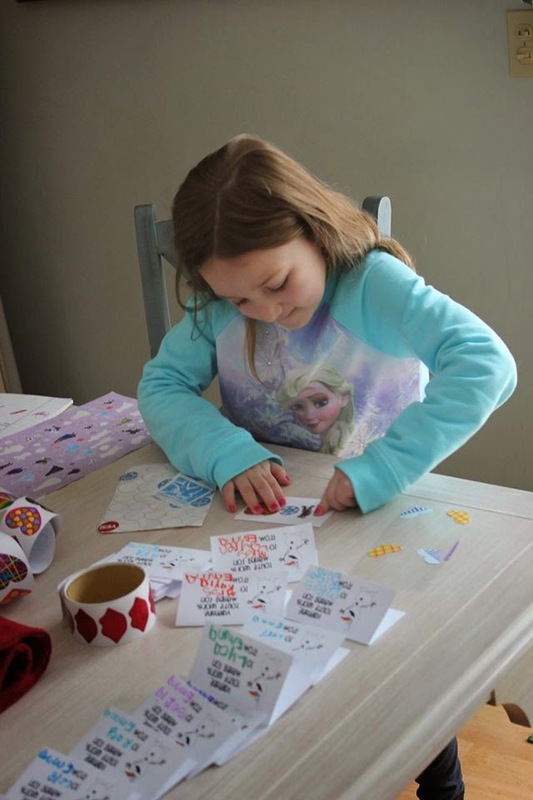 They came out really stinkin' cute, & you loved every moment of making these Valentines. There were no Valentine tears this year!!! 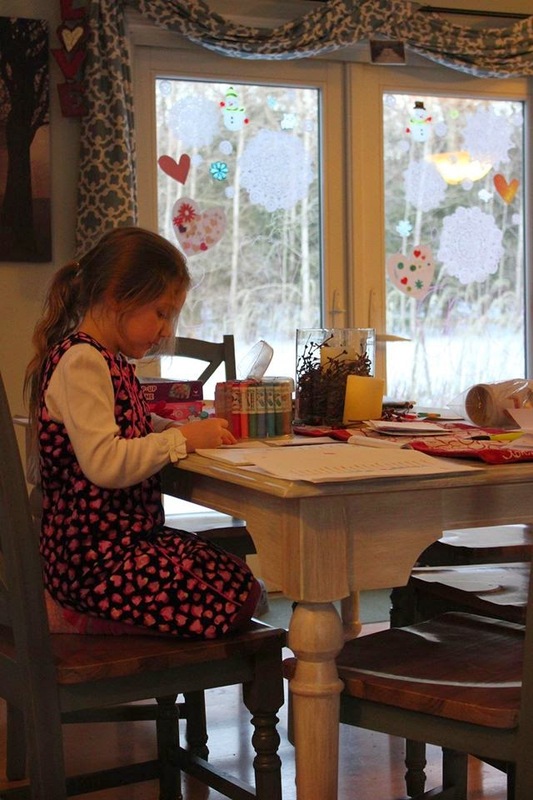 Perhaps the secret is in letting you pick out an age appropriate Valentine project. Please remind me of this next year!